A dedicated volunteer officially opened Birmingham St Mary’s Hospice’s latest shop in Northfield last week (04/04), coinciding with the charity’s milestone anniversary celebrations. Nancy Byrne from Moseley has been volunteering at the Hospice for 40 years, ever since it opened its doors and cared for its first patient in March 1979. The kind-hearted volunteer will be a familiar face to many patients, family members and loved ones who have visited Birmingham St Mary’s over the years, as she is best known for welcoming people on reception. Over the past four decades, Nancy has supported with general admin work, driven patients to-and-from the Day Hospice and volunteered on reception, roles that she has enjoyed doing because “it’s a privilege to help people at a time when they need it most”. 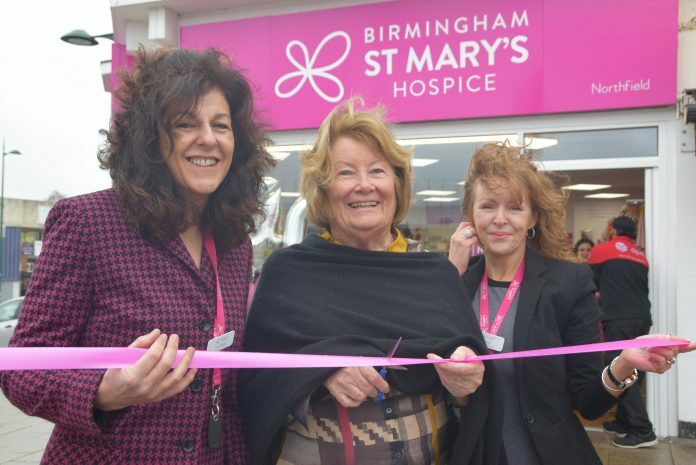 To recognise her outstanding commitment to the Hospice and to celebrate the first Birmingham St Mary’s shop to open during its 40th anniversary year, Nancy was invited to officially cut the ribbon at the Northfield store. Based at 734 Bristol Road South, the shop is the charity’s 17th across Birmingham, Sandwell and Solihull and aims to raise vital funds so the Hospice can continue to care for local people living with life-limiting illness. Birmingham St Mary’s Hospice was founded by former NHS matron Monica Pearce, whose mission was to “enable anyone with a life-limiting illness to live their life to the full” – a statement that the Hospice’s staff and volunteers still stand by today. When the Hospice first opened, it could care for just 25 people on any given day. Four decades later and the Hospice is supporting over 400 people every day, providing care in people’s homes, in the community, and at the Hospice itself. The Hospice’s shops provide a vital source of income for the charity, ensuring it can continue to care for people at a time when they need it most, wherever and whenever they need it. In the last 12 months, the charity has launched four new shops, including its first in Sandwell.